Please see update on our gear presentation. Please note change of date due to delay. No games played during the school holidays or public holiday weekends. If you are new to Mini League or would like to learn more about playing in our exciting new competition, then come along to the Come & Try Day on Sunday 18th March at Waverley Oval. During the session, participant will be introduced to Mini League, learn basic skills, watch a demonstration game and score lots of try themselves in a non-competitive fun based playing scenario. The aim of the session is to ignite the passion of young players and is all about having fun. The Come & Try Morning will be jam-packed full of fun activities for the whole family. There will be face-painting, jumping castle, Rocky The Rooster, Roosters stars and kids giveaways . The Roosters brand new Christmas Roadshow is coming to the Easts Group this December. Your mighty Sydney Roosters are taking their ever popular Holiday Camp program on the road this Christmas, visiting our fans and Members in Kingswood, Berkeley, Woy Woy and Waverley. Kicking off in the first week of the Christmas school holidays, the Roosters Christmas Roadshow is for boys and girls aged 5 to 14 years old, love the Roosters and are looking for some festive fun. Come celebrate the festive season with your favourite Roosters, say hello to Rocky the Rooster, enjoy performances and learn some moves from the fabulous Roosters Girls. Have a dance at the Christmas Disco, test your skills with fun rugby league games, create Christmas arts and crafts AND Santa will be there with a present that will light up any kids face. The Roosters Christmas Roadshows runs for three hours and cost just $40 per child. For an additional $20.00 you can opt for a special 2018 kids Christmas Membership, which includes; two General Admission match tickets to a 2018 regular home game, Roosters stickers, lanyard, and a Roosters cap all wrapped up in time for Christmas! Don’t miss this fantastic offer, register your child for a Roosters Christmas Roadshow near you today! 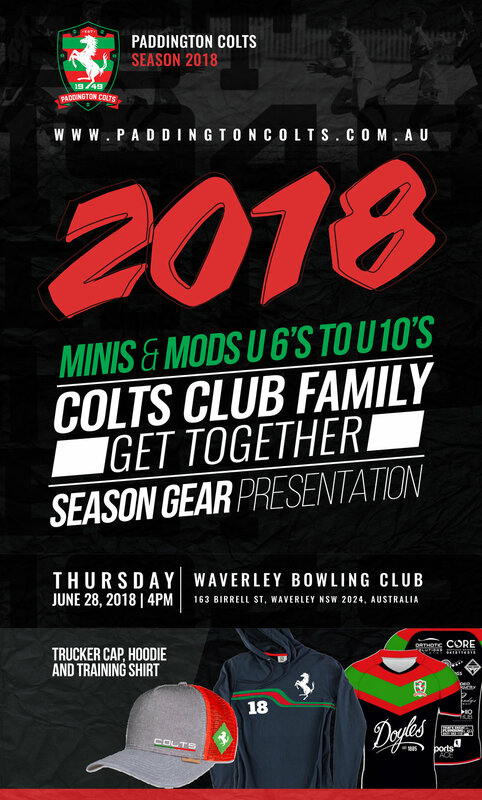 In celebration of another successful year for our great club on November 19 at Parsley Bay we will have a Colts year end celebration and presentation. This is to thank you all for the overwhelming support to our club and teams both our mini's and seniors. We congratulate all the teams especially our Under 16's Div 1 for winning back to back premierships and our runner ups, Under 9's and Under 12's. The Sydney Roosters are excited to announce details of the Brand New Super Sport Camp coming this October. The two-day Super Sports Camp is for kids age 5 - 12, who love their sport and keeping active. Aimed at all levels and abilities, activities include Rugby League, Basketball, Soccer, Dance and Netball, as well as appearances from Roosters ambassadors, giveaways, an exclusive holiday camp T-Shirt and much more! Led by the Sydney Roosters and NRL qualified coaches, the Super Sports Camp is all about having fun. This year, marks a milestone for our great club its the 50th Anniversary of our first ever A Grade winning premiership team (1967). To celebrate this, we are honouring that team. We would love to have your company. This is a great tradition at the Paddington Colts, and will be held at the beautiful and historical Parsley Bay. We welcome all our senior players, all our past players, past members, netballers, officials, rivals, friends and of course our great new parents and members. It will be a great day. The event will also be our reunion, this will be an opportunity for all new members of our great club to see the traditions, history and camaraderie that is unique to the Paddington Colts since 1949. Join us to celebrate the past, the future and the relaunch of our great club. Next Friday, The Mighty Paddington Colts take on Dirty United in the 2nd Jasper Aubrey Golf Day. A great day will be had by all and last time it was declared a draw, just the way Jasper would have liked it. In loving memory of the great Jasper Aubrey this year its on again.